Address toxic behaviors early to lead and sustain great morale. Kate Nasser, The People Skills Coach™ – 1 minute message! Demeaning and degrading teammates. It isn’t honesty and authenticity, it’s bullying. It is an attack on their dignity. Don’t do it yourself and stop those you lead from doing it. Passive aggressive behaviors. They grow like a quiet cancer on trust. Without trust, teams fall apart. Leading morale behavior tip: Call out passive aggressive behaviors and address the underlying issues. The team and performance will be better for your effort. Bias — explicit and implicit. Every team member needs to know that they matter and have an equal opportunity to contribute. Exclusion. Belonging is a universal human need. Being excluded at a place you work everyday kills morale. Credit stealing. Recognize every contribution and stop those you lead from taking credit for other’s work. Address toxic behaviors directly. If you tell the employees to work it out for themselves, they won’t. Most will redirect their energy from productive work to the work of sidestepping the toxic behaviors. Why? Because morale is all about dignity. When people feel that their leaders, managers, or co-workers are attacking their dignity, it shifts their attention from work to the loss of dignity. 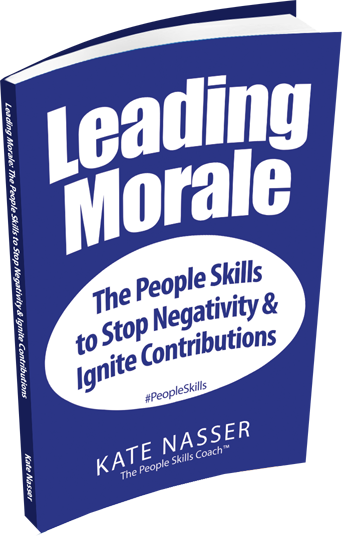 For additional concrete steps to leading morale, get Kate Nasser’s new book Leading Morale right now on Amazon.com. What leading morale behavior tip will you share with us right here? Spot on! Also resonates in our families. As parents, we may try to control our children but it’s a powerful mindset shift to think about how we too need to lead morale. Also, I appreciate that you distill the essence of morale as dignity. It’s not something I’ve seen others point to, but it makes perfect sense. Happy to help spread the message. Thank you Alli. I think it’s a message that has been a long time coming. So many leaders/managers think of morale as events. It isn’t!